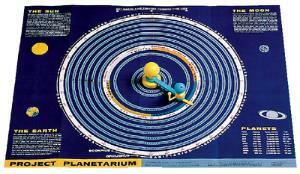 Individual students can investigate Earth, sun, planet, and lunar relationships with these models. They may also be used in conjunction with demonstration planetaria. Positions of the planets may be marked by date on an erasable, plastic-coated base chart, and models of the Earth and moon can be set for any time or date. The colorful base chart has supplemental information about the sun, moon, Earth, and planets for quick reference. With teacher’s guide and storage container.